Functional About Card – a better business card? 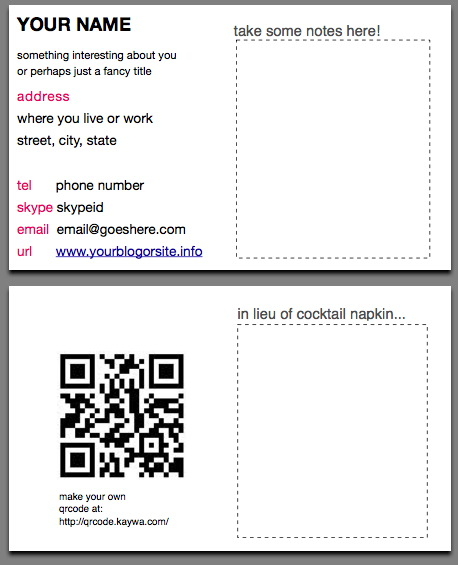 This morning, upon realizing my old business cards were mostly out of date, I decided to design a new card. I pulled up the most excellent Apple Pages and started designing away… now they have some nice built-in templates, but the problem is that you always end up with something you can’t easily manufacturer in the comfort of your own home. I’ve gone through a few sets of Moo cards, but I’ve grown weary of them a bit, as they just seem to disappear so quickly and aren’t that cheap. I looked at my stack of paper next to the printer, and noticed some index cards I had bought for recipes, D&D and perhaps a little-used Hipster PDA. In that moment, I was struck with a minor inspiration, which resulted in the work below… though its up to you to decide, of course, how productive my morning actually was. Introducing… the Functional About Card (fāc)! The Functional About Card (fāc) is a business card format & template that prints on 3×5 index cards in the color of your choice (Office Depot 500 pack on Recycled Paper for $2.89). The goal was to create a business card that can be easily produced on demand with a home printer, and is actually useful and functional, as opposed to the usual dead tree spam you usually get that just collect dust. You could optionally replace the note-taking area on the right with a maze, crossword puzzle, madlib or other small format, amusing game. Anyone you give you a card to will be delighted later when they discover that you’ve actually given them something fun to pass the time. I’ve chosen to use the back side to display a QRCode, but if that is just way too geeky for you, feel free to put a picture of yourself, your pet, your favorite flower or historical figure (Ben Franklin!). You might also expand the right “idea napkin” area to the whole card, because admittedly, 3×2.5″ isn’t much room for a great idea. Make sure to lightly score (with a screw driver, razor blade or exact knife) and fold the card down the middle of the long length… this way it fits nicely into wallets, pockets and other places people typically put these things. This also makes the card a bit easier to tear evenly in half, in case it needs to be used as a part of a sneaker net data transmission. Oh, yeah, and this template has been released under the Creative Commons By Attribution 3.0 license. 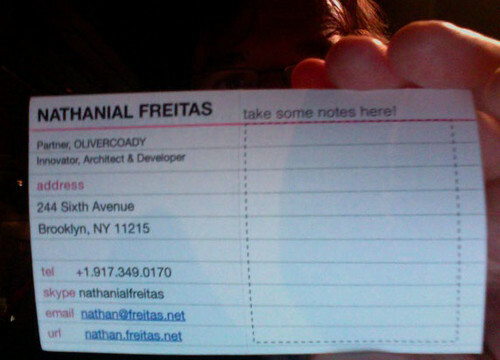 Functional About Card by Nathanial Freitas is licensed under a Creative Commons Attribution-Share Alike 3.0 United States License. Permissions beyond the scope of this license may be available at http://openideals.com. So, there it is… I hope you love it, and if not, that you’ll provide some useful suggestions and improvements upon this flight of fancy. I know this is an old entry, but it’s a neat idea. I seem to recall seeing somebody’s business card with “notes” written atop the blank backside, so yeah, same idea, but extended. One minor note — I think you should flip the panels on the back of the card. That is, the “notes” section should be on the left-hand side. I would suspect that most people flip cards over from left to right, as opposed to flipping them up. Thanks for the feedback…why don’t you download my Pages file and make some modifications – that’s what open-source is all about, right? 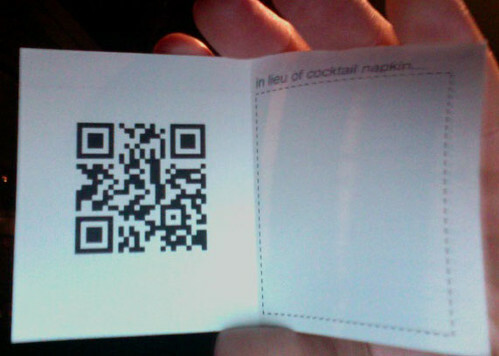 But I would like to suggest you my 2D barcodes generator. 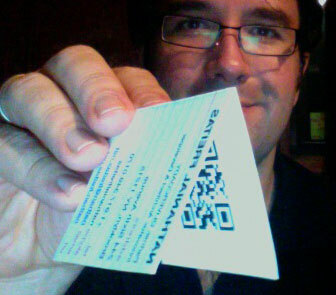 You can create color 2D barcode with QR-Code and Datamatrix symbologies ( http://www.tagmore.com/moo ).